What happened to Cromwell’s body after his death? Oliver Cromwell died at Whitehall during the mid-afternoon of Friday, 3rd September 1658, probably from complications following an attack of the ‘tertian ague’, a form of malaria common in Western Europe at that time. His decline had been rapid. Cromwell was probably already ill when his favourite daughter, Elizabeth Claypole, died of cancer on 6 August, although he had recovered sufficiently to go riding on 17th August, when he was seen by the Quaker, George Fox. A relapse followed, but he was able to continue to conduct official business until 28th August. A week later he was dead. He died yesterday about four of the clocke in the afternoone. I am not able to speake or write; this stroake is soe soare, soe unexpected, the providence of God in it soe stupendous, considering the person that is fallen … I can doe nothinge but put my mouthe in the dust, and say, It is the Lord; and though his wayes be not always knowne, yet they are always righteous, and wee must submit to his will. Thus it hath proved to him to be a day of Triumph indeed, there being much of Providence in it, that after so glorious Crowns of Victory placed on his head by God on this day, having neglected an Earthly Crown, he should noe go to receive the Crown of Everlasting Life. Cromwell’s friends and allies might well look for signs that God was still on their side. It had long been feared that the protectoral regime depended on the survival of one man. As Protector, Cromwell wielded great power, arguably greater than that enjoyed by any English king. His authority, both as a military leader and as a sincere, godly ruler, gave him tremendous personal political influence, not least over the army. Indeed, he was able to keep the army in check while making efforts to broaden support for the protectorate by introducing civilian elements into the government – a step that was unwelcome to many officers and other ranks. There were some around the Protector who wanted to push such reforms far further, by making him King Oliver, but in May 1657 he had publicly rejected this offer. He did, however, accept a new, civilian constitution, known as The Humble Petition and Advice, in the following June. One crucial change brought about by the Humble Petition was allowing the Protector (rather than his council) to name his successor. On his death-bed, Oliver chose his eldest son, Richard, as the new Protector. Richard was proclaimed on 4 September. His highness hath given very great satisfaction to the officers in the late address. It is our duty to be earnest for him, that he may be kept up to walke in his father’s paths with that integrity, as may manifest by what spirit he is ledde forth by …he hath hitherto much exceeded expectation, and did speak heartily to old freinds. All things being prepared, the Effigies of his Highness standing under a rich Cloth of state, having been beheld by those persons of honor and quality which came to attend it, was afterwards removed, and placed on a Herse, richly adorned and set forth with Escutcheons and other Ornaments, the Effigies it self being vested with royal Robes, a Scepter in one hand, a Globe in the other, and a Crown on the head. 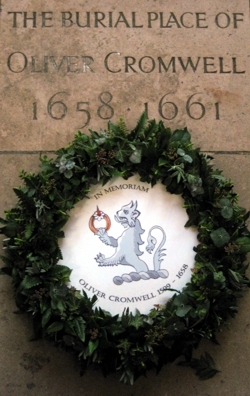 The burial of Cromwell’s body took place privately in Westminster Abbey on 10th November, nearly two weeks before the formal funeral ceremony. On the same day the effigy, which hitherto had been displayed lying down, was raised into an upright position. The Carriage it self was adorned with Plumes and Escutcheons, and was drawn by six horses, covered in black Velvet, each of them likewise adorned with Plumes of Feathers … At the Westgate of the Abby Church, the Herse with the Effigies thereon, was taken off the Carriage … and in this magnificent manner they carried it up to the East End of the Abbey; and placed it in that Noble Structure which was raised there on purpose to receive it; where it is to remain for some time, exposed to publick view. The official account underlines that this was very much a ‘publick’ ceremony, in contrast to the private burial that had preceded it. The state funeral was not so much an opportunity to celebrate a life or to pay respects; it was a reaffirmation of the protectoral regime. The succession had proved smooth, but there were many problems facing Richard Cromwell. Despite efforts to reduce military influence within the government, the regime had still not secured public support. According to the republican, Edmund Ludlow, the ‘folly and profusion’ of the lying in state ‘so far provoked the people, that they threw dirt in the night on his escucheon [sic] that was placed over the great gate of Somerset House’. The royalist, John Evelyn, reported of events on 23 November that ‘it was the joyfullest funeral that ever I saw, for there was none that Cried, but dogs, which the soldiers hooted away with a barbarous noise, drinking & taking tabacco in the streets as they went’. As Evelyn hinted, ambivalence among the soldiery had increased by November, despite the officers’ protestations of loyalty two months before. Earlier, Fleetwood had made it clear that the army’s attitude depended on Richard emulating Oliver. It was now all too obvious that the new Protector had other priorities, and that the civilian politicians intended to rule the roost. In political terms, the funeral, with its public show of unity among all sections of the state, was little more than a hollow sham. Tensions between the army and the Protector’s allies would increase further during the new year of 1659, and in May Richard was deposed by the very officers who had marched in his father’s funeral procession six months before. The leader of the coup was the chief mourner, Charles Fleetwood.